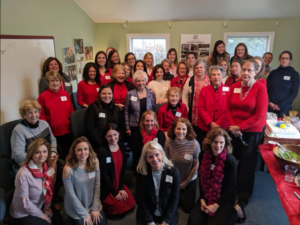 Darien, CT (February 9, 2018): The Junior League of Stamford-Norwalk, Inc. (JLSN) is celebrating its 95th anniversary this month. Members celebrated the milestone with a brunch on Sunday, February 11. “We have a rich history in Fairfield County and our 95th anniversary is an opportunity for us to reflect on that legacy while celebrating our members, our community and corporate partners, and the path forward to our centennial in 2023,” said Char Zoller, JLSN President 2017-2018. Since 1923, JLSN has been committed to improving the community through volunteer service and by training local women leaders. Over the years, JLSN has founded or participated in the founding of 88 community agencies including Domestic Violence Services, Lockwood-Mathews Mansion Museum, The Maritime Aquarium, Shelter for the Homeless (Pacific House), The Volunteer Center of Southwestern Fairfield County, The Women’s Crisis Center and the Fairfield County Women’s Center at Norwalk Community College. JLSN’s current community focus is on improving school readiness and literacy among elementary school students through its Read 2 Succeed program.